For more than 10 years GEFRA GmbH has been able to offer a real 360° surround inspection using four cameras to inspect the surface of round parts to find coating defects, head cracks and external thread damage. One of the big advantages of the GEFRA system is that the parts run continuously with a speed of up to 600 parts per minute. This system can be used on a glass dial machine with standing parts, as well on the slot dial machine with parts hanging in the disc. 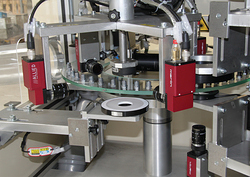 Since 1995, GEFRA has developed and manufactured optical inspection systems for fasteners, and other bulk products, for a variety of industries. GEFRA states that its OPTISORT® systems ensure an efficient 100% automatic quality control where a cost-efficient and zero ppm error quote is needed. Complex geometric measurements, thread control, inspections for damages such as scratches, dents, points of impact, cracks, errors in colour and surface coatings, and more, can be realised. GEFRA points out that over 280 of its systems are on the sites of many famous national and international fastener manufacturers and sorting companies. Over recent years the demands for thread inspection have become much more important for GEFRA’s wide variety of customers – including manufacturers of automotive and aircraft fasteners. That’s the reason why most of GEFRA’s inspection systems have the additional four cameras inside. The 360° inspection system is very flexible and can be used for head cracks from the side, thread inspection on different length and also for bended parts. The position in the height of the cameras can be moved depending on the areas that are to be inspected. The approved Windows®-based system software AUTOCONTROL, made by GEFRA, does the image processing and generates the IO/NIO decision with the help of an individual quality control plane, which includes all important parameters of the part. While the program is running, it is possible to save the pictures of the checked threads. If the user wants to see the damages, they can recall the images from the computer storage. With these pictures the operator can compare the checked parts with the calibration part. 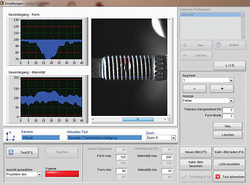 The picture of the calibration part can be called up whilst the operator is adjusting, so the operator can make a direct comparison. GEFRA’s product portfolio is complemented by a wide spectrum of accessories for packaging, service, maintenance and training. The GEFRA team guarantees a high availability of spare parts, and a short reaction time to enquiries.